HYT made a splash by becoming a brand no longer primarily focused on displaying time with liquids. Electricity is now part of the technological know-how this brand masters. Seeing the time at night is a problem commonly shared by many brands. The brightness of luminescent material usually used on hands and indexes decreases hour after hour during the night; no real solution exists outside of backlit screens on electronic models. Taking the lead here – though this is not yet known, there are other brands indeed in the race - HYT has created the first electric micro generator integrated into a mechanical watch that is able to power two LED lights working alternatively and at a super high speed. Contrarily to what one might surmise, the system has no electronic components and was conceived following the technical rules of traditional watchmaking. Indeed, it contains 80 components including gears that are powered by the owner just by winding a dedicated crown. In doing so, he or she charges a mainspring that is liberated by pushing a button integrated into the crown. The power stored within is then released, activating a micro generator especially conceived for this purpose. Just like with the fluidic module that indicates the hours, the micro generator was developed by Preciflex, the R&D and industrial sister company of HYT. And the result is impressive as the two LED lights positioned at 6 o’clock just illuminate the core of the movement, making it look like an industrial cathedral by night. This new lighting system is not a gimmick but an efficient tool to see the time that is usually obscured. 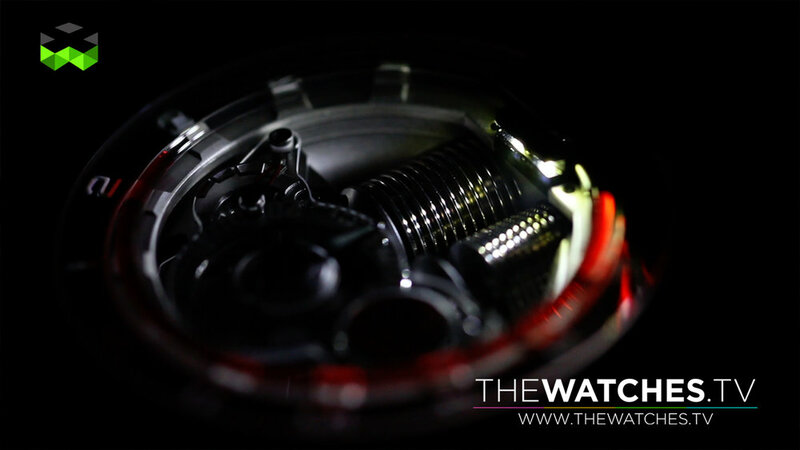 It also has another purpose that aficionados will not often admit: it allows one to play with the watch. Because in the end, we are talking about toys for big boys, aren’t we?